Page Under Construction! Files will be uploaded soon! Sheffield is a city and metropolitan borough of South Yorkshire, England. Its name derives from the River Sheaf, which runs through the city. Historically a part of the West Riding of Yorkshire, and with some of its southern suburbs annexed from Derbyshire, the city has grown from its largely industrial roots to encompass a wider economic base. 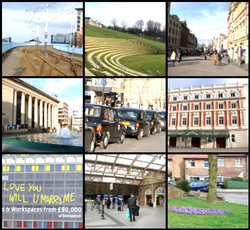 The population of the City of Sheffield is 555,500 (2010 est.) and it is one of the eight largest regional English cities that make up the English Core Cities Group. During the 19th century, Sheffield gained an international reputation for steel production. Many innovations were developed locally, including crucible and stainless steel, fuelling an almost tenfold increase in the population during the Industrial Revolution. Sheffield received its municipal charter in 1893, officially becoming the City of Sheffield. International competition in iron and steel caused a decline in traditional local industries during the 1970s and 1980s, coinciding with the collapse of coal mining in the area. The city is located within the valleys of the River Don and its four tributaries, the Loxley, the Porter Brook, the Rivelin, and the Sheaf. 61% of Sheffield's entire area is green space, and a third of the city lies within the Peak District National Park. There are more than 200 parks, woodlands and gardens in the city, and an estimated 2.5 million trees, giving Sheffield the highest ratio of trees to people of any city in Europe.